While it's only been about a month since Vinnie's Pizzeria unleashed its insane pizza served in a box made of pizza, it appears the marinara maniacs have somehow taken the cheese-fueled madness to a whole new level with their latest monstrocity: a pizza topped with mini slices of pizza served in a box made of more pizza. Vinnie's first revealed the pizza overload in an Instagram post on Saturday, claiming the beastly pie (or pies?!?) came to life when a customer ordered a Pizza Box Pizza and requested mini pizza slices on top of the pizza inside. Perhaps the easiest way to describe the thing is pizza on pizza on pizza. 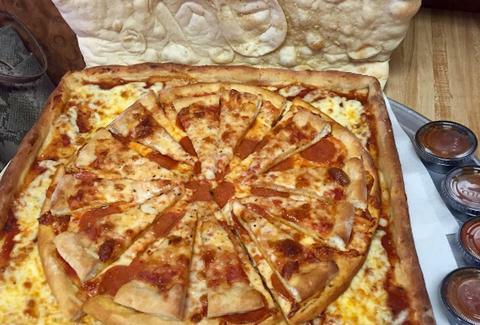 It's basically a pizza engineering marvel, or as Vinnie's put it, "#infinitypizza." Believe it or not, Vinnie's has already sold at least five of so-called Pizza In A Box Topped With Mini Pizzas as of early Sunday afternoon, according to a report by Gothamist. Sean Berthiaume, the pizzeria's co-owner, told the publication, "Our philosophy is 'Yes, you can do whatever you want,'" when it comes to ordering a pizza there. In other words, you can eat one of these crazy things (or something crazier), if you're willing to pay up. The #infinitypizza experience will set you back $46, per the report. But if you're not ready to take on such a giant pile of pizza, Vinnie's recently introduced a smaller, handheld version of the original Pizza Box Pizza, the aptly dubbed the Mini Pizza Box Pizza. Or, you can always order a slice of Vinnie's famous "Cheeseception" pizza, topped with -- of course -- mini slices of more pizza. At this point, it's hard to imagine how they'll top (no pun intended) this latest creation, but it's probably inevitable. Tony Merevick is Cities News Editor at Thrillist and thinks someone should order the Pizza Box Pizza filled with a bunch of the Mini Pizza Box Pizzas. Send news tips to news@thrillist.com and follow him on Twitter @tonymerevick.